But then we talked about how Luke had every reason to despise or hate his father, but instead he chose to love him and feel pity for him. He even told his dad so. 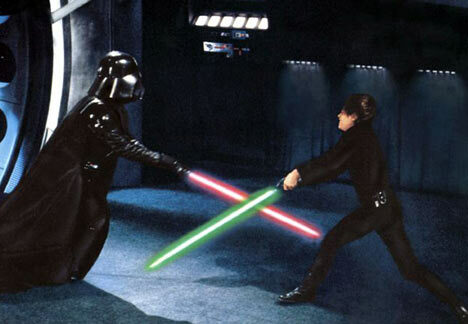 Even when his dad stopped believing in himself – “It is too late for me, son” – Luke never gave up on him! Luke even gave himself up in the third movie and let himself be captured to go and face Darth Vader and his even more evil boss, the Emperor! (Now Luke was on the edge of the couch.) There, the Emperor told him of the trap that would kill all his friends and that Luke would have to join the evil side, like his dad, or be destroyed. The Emperor wanted Luke to kill his own father. But Luke refused. He loved his dad, even though he had done so much bad. He refused to fight him – only defending himself as his father attacked him under the Emperors orders. 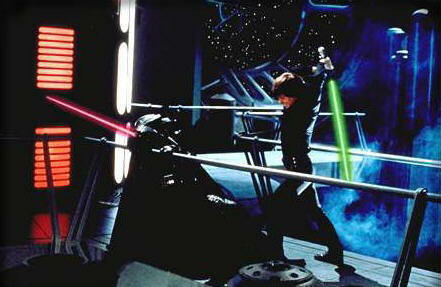 But then Darth Vader got Luke angry. 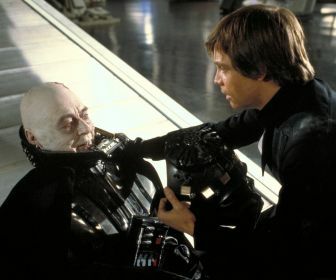 He told Luke if he didn’t turn to evil, he would go after Luke’s sister, and that got Luke upset and then Luke attacked Darth Vader to save his sister – he defeated Darth Vader and even cut off his hand to make his light saber fall away! Darth Vader was defenseless! Now Luke could have killed him if he wanted. Did Luke do it? No. He was good. The Emperor ordered him to kill his father and take his place – but Luke did the most amazing thing, he threw down his light saber and said, “I am a Jedi, like my father before me.” He spoke of his father like he was good. He spoke of the time when his father was a good Jedi, of the time when his father would have died to do the right thing, and chose now to die doing the right thing, as his father would have done long ago. He wanted his dad to see that he had raised a good son, willing to die for good, even though he himself had failed, he had succeeded in having a good son, a son willing to die for him. My Luke says, “He must feel very loved.” I said, “I bet he does.” The drama only intensifies from there. The evil Emperor comes down, and says, “So be it. Jedi.” (Said with condescending disgust.) “Only now, at the end, do you understand. If you will not turn to the dark side, then you will be destroyed.” It was, in truth, the Emperor, who was not understanding that a plan of Redemption was unfolding right before his very eyes. This master of evil was unable to see the conflict boiling up within his apprentice, Vader, whose murder he had just ordered – a plot that had been foiled by love. 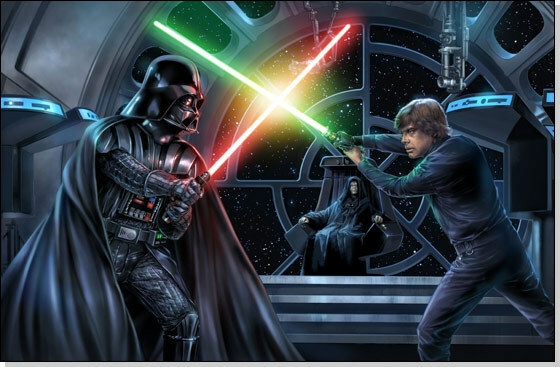 The Emperor bellows to Luke, “Your feeble skills are no match for the Power of the Dark Side!” When in truth, this act of sacrificial love by this young Jedi would prove more powerful than all this powerful master’s evil schemes! 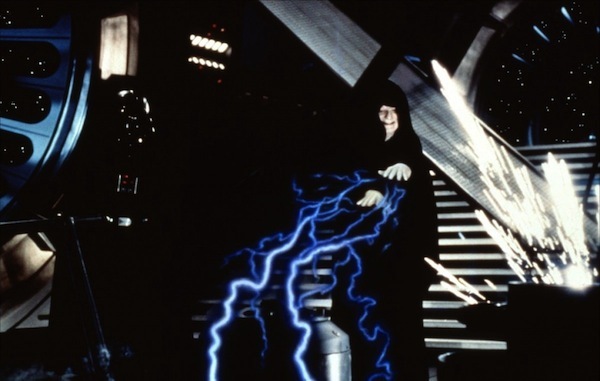 And then the Emperor begins to electrocute him with that powerful blue lightening from his fingertips. Darth Vader rises and keeps looking back and forth between his son who is suffering in agony and this evil leader who is killing him realizing he has a choice to make. Save his son or stay with this evil Emperor, who would have had his son kill him. I’ve always wondered if this was when Darth Vader woke up and realized he would be replaced as soon as his leader found a stronger Number Two, despite Vader’s fierce loyalty. The Emperor pauses, only for a moment, to say, “And now, young Skywalker, you will die.” During the final burst of lightening, Darth Vader looks back and forth a few more times, as if to antagonize the suffering audience some more, before making his choice. Finally breaking from his frozen state of inaction, he bursts into motion, lifts up the Emperor and tosses him over a railing and down into a reactor shaft where he falls, wailing as he plummets, until, finally, he dies. Not only is Luke saved, but Darth Vader as well. When Luke says, “I must save you,” Darth Vader answers, “You already have.” Vader does not physically survive the ordeal, perhaps due to his battle with Luke or the lightening when he lifted the Emperor, but his redemption comes from his choice to save his son and turn back to the good side, and the evidence in the world of Star Wars, is his being seen with Obiwon and Yoda at the end of the film in their ghostly jedi forms from the after life. Indeed, the faith and love of a son, brought salvation to a man everyone else thought was unreachable. I may pretend to have Jedi powers when I open automatic doors at the grocery store or open the garage door, but the truth is I am powerless. 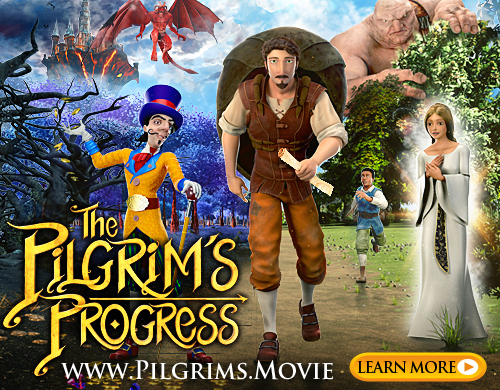 And I’m not a righteous person. I’m not even a good person. But God’s demonstrated his love toward me by having his Son lay down his life for me. 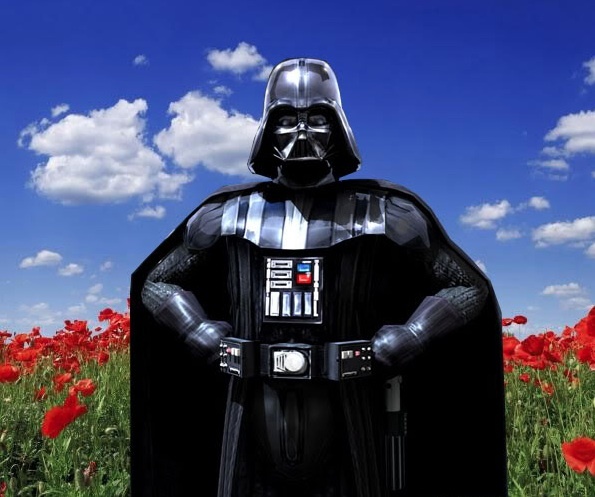 He could have killed me for my sin – I deserve it as much as Darth Vader, for disobeying God. There is no one righteous enough to merit salvation. The real evil Emperor, Satan, has invited me to rule my own life at his side – but Jesus defeated him on the cross, dying in the process, for me. Star Wars teaches us that there is NO ONE beyond hope. There is good in everyone – and we ought never give up hope on anyone. Love can conquer anything and anyone and that evil will ultimately be defeated by the Power of Love.